Tim Burton's The Nightmare Before Christmas is turning 25 this year, and Diamond Select Toys is celebrating with a line of cloth-costumed, fully poseable action figures! 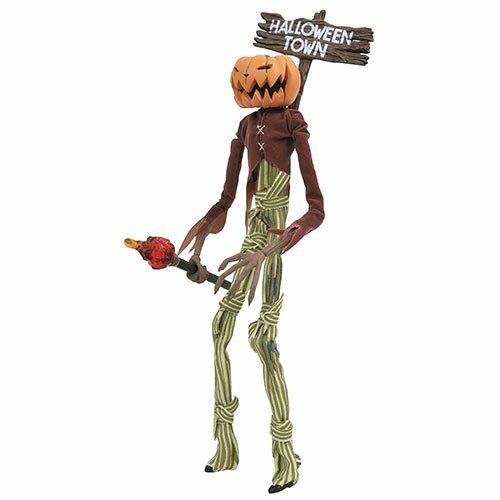 Measuring approximately 10-inches tall, the Nightmare Before Christmas Silver Anniversary Pumpkin King Jack Skellington Action Figure figure features real fabric outfits, multiple points of articulation and character-specific accessories. Pumpkin King Jack comes with a sign and torch and comes packaged in a coffin-shaped window box. Ages 14 and up.